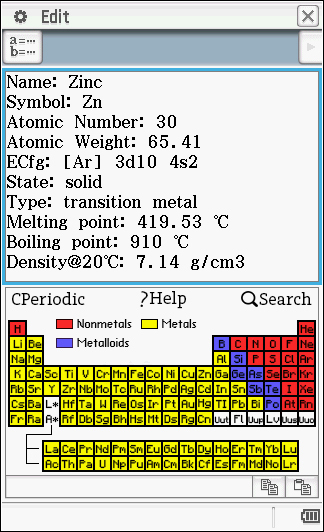 I wrote a new program for ClassPad II, a periodic table. 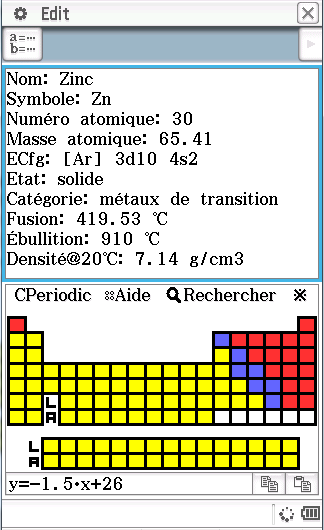 -Contain Name, Symbol, Atomic Number, Atomic Weight, Eletron Configuration, State, Type, Melting Point, Boiling Point and Density@20ºC of the 118 elements. The information was taken from wikipedia. There is no small font in basic and is hard to create small characters with Line basic command ( i did it for L and A, but the size is still large) so there are no text inside of the table (in cells). Anyway, the use of stylus and search function make it intuitive. If you find any bug (in program or even in information) or if you have any suggestions, leave a comment. Is this split screen something that CP Basic does natively? Top half is text low half is graphic? Yes. Im using the 1st half screen to display the information(text) and 2nd to display the graphic (table). Is possible also do the inverse (1st for sketch commands and 2nd for text) calling the command ClrText at the beginning of programs (but the coordinates will be different). It takes +/- 6-8 seconds to draw the table. I tried today save the table in an image file .c2p, and it makes the program (draw) faster the table. Hi Helder7 ! Nice project, can you share it on Planet-Casio when it will be finished ? Yes i can/will share. I'll make some minor improvements like delete all variables when closing the program (to keep Variable Manager clean), etc... in next update. And perhaps I will create (...or better translate...) a French version especially for Planet-Casio. I'm still not sure if I should continue to use the actual sketch commands or swith to an image file (.c2p) captured during program execution to draw the table. And the separated FR translation/version is finished. I uploaded the FR version in planet-casio also. More than 6 months after the release of the first version, today is released the version 2.00 . 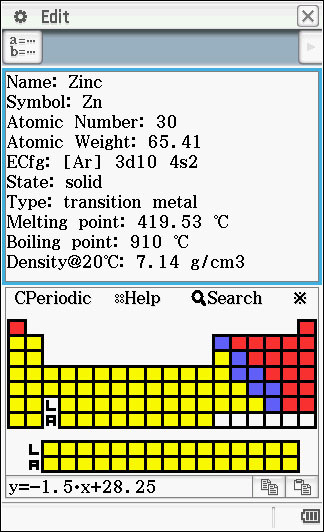 -Was added the symbol of the elements in the table, as well as a legend. -All variables used (except lists with data) are now Local. (this helps you keep the Variable Manager clean). 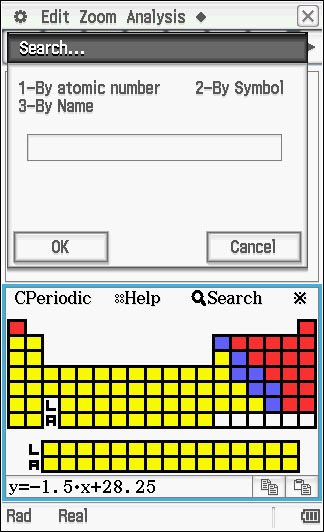 -Was removed support for search by old name, for the 2 recent renamed elements (Flerovium and Livermorium) by IUPAC. From now on, only the new name is supported. -Search by name is not case sensitive. You do not have to worry more about uppercase or lowercase letters. -The speed was slightly improved, at least on the startup. love the idea of this, and it looks slick! Aha -- think I figured it out! I have an early-release model with older OS. Nice program! Is normal the little "loading" indicator keep spinning. This means that the program is running and waiting to get the pen coordinates. I tried to do my best when I created/updated this program and I think I can not improve more than the current 2.00 version, in terms of speed. If I am right, sometimes the calculator/program does not respond to first touch the screen, you have to touch them for a while. How do I use it? Imported all files but the c2p file says Invalid Data Type, and when I tap run in the Program app it says Undefined Variable.